Even though it's only 250 pages (exactly), Hathaway manages to have you embroiled in the plot, invested in the characters and intrigued as to what is going to happen within the first chapter. What's so enjoyable about Slide is that it combines multiple genre aspects, making it appealing to readers of mystery and contemporary, while at the same time adding in a dash of romance. Each aspect of the book was enjoyable, the mystery was sound and I found myself making a few predictions - some that came true and some that really didn't. I also thought it was a bit reminiscent of the movie Scream, with Neve Campbell, in some aspects. I have never read a book with narcolepsy being the backing for the plot before, so I was excited because it was a really cool concept. I thought that it was used well, and Hathaway's take on it was original and gave the book another dimension. There were red herrings that invaded all aspects of the plot, some obvious, some not so, and this use of so many distractions just amplified the feeling that you were in Vee's head. I thought that it was really clever and made you relate to Vee and her confusion on a subconscious level. The elements of the genre were used cleverly within the story. Highlight from asterisk to asterisk to read my thoughts BEWARE THEY CONTAIN SPOILERS! I thought that the new love interest turning out to be the killer was a really clever play on the contemporary genre and how the protagonists usually fall blindly in love with this guy that they have just met; completely trusting them for no good reason. Once again, reminding me of Scream with the ending. 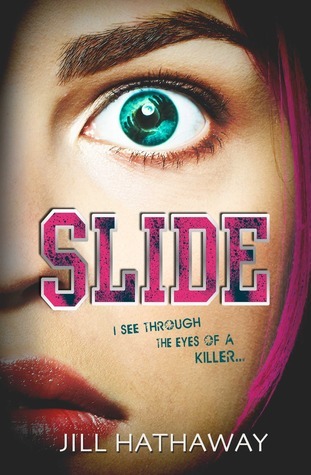 If you enjoy a mystery, contemporary novel with a protagonist that does not wimper at every turn, and/or are a female aged around 13-17, then I think that you will enjoy Slide. I really like the look of this, sounds so cool!